This article is about the period in Jewish history. For other uses, see Babylonian captivity (disambiguation). Archaeological studies have revealed that not all of the population of Judah was deported, and that, although Jerusalem was utterly destroyed, other parts of Judah continued to be inhabited during the period of the exile. The return of the exiles was a gradual process rather than a single event, and many of the deportees or their descendants did not return, becoming the ancestors of the Iraqi Jews. In the late 7th century BCE, the Kingdom of Judah was a client state of the Assyrian empire. In the last decades of the century, Assyria was overthrown by Babylon, an Assyrian province. Egypt, fearing the sudden rise of the Neo-Babylonian empire, seized control of Assyrian territory up to the Euphrates river in Syria, but Babylon counter-attacked. In the process Josiah, the king of Judah, was killed in a battle with the Egyptians at the Battle of Megiddo (609 BCE). After the defeat of Pharaoh Necho's army by the Babylonians at Carchemish in 605 BCE, Jehoiakim began paying tribute to Nebuchadnezzar II of Babylon. Some of the young nobility of Judah were taken to Babylon. In the following years, the court of Jerusalem was divided into two parties, in support of Egypt and Babylon. 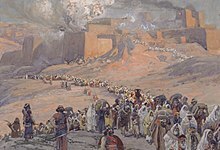 After Nebuchadnezzar was defeated in battle in 601 BCE by Egypt, Judah revolted against Babylon, culminating in a three-month siege of Jerusalem beginning in late 598 BCE. Jehoiakim, the king of Judah, died during the siege and was succeeded by his son Jehoiachin (also called Jeconiah) at the age of eighteen. The city fell on 2 Adar (March 16) 597 BCE, and Nebuchadnezzar pillaged Jerusalem and its Temple and took Jeconiah, his court and other prominent citizens (including the prophet Ezekiel) back to Babylon. Jehoiakim's uncle Zedekiah was appointed king in his place, but the exiles in Babylon continued to consider Jeconiah as their Exilarch, or rightful ruler. Despite warnings by Jeremiah and others of the pro-Babylonian party, Zedekiah revolted against Babylon and entered into an alliance with Pharaoh Hophra. Nebuchadnezzar returned, defeated the Egyptians, and again besieged Jerusalem, resulting in the city's destruction in 587 BCE. Nebuchadnezzar destroyed the city wall and the Temple, together with the houses of the most important citizens. Zedekiah and his sons were captured, the sons were executed in front of Zedekiah, who was then blinded and taken to Babylon with many others (Jer 52:10–11). Judah became a Babylonian province, called Yehud, putting an end to the independent Kingdom of Judah. (Because of the missing years in the Jewish calendar, rabbinic sources place the date of the destruction of the First Temple at 3338 HC (423 BCE) or 3358 HC (403 BCE)). The first governor appointed by Babylon was Gedaliah, a native Judahite; he encouraged the many Jews who had fled to surrounding countries such as Moab, Ammon and Edom to return, and he took steps to return the country to prosperity. Some time later, a surviving member of the royal family assassinated Gedaliah and his Babylonian advisors, prompting many refugees to seek safety in Egypt. By the end of the second decade of the 6th century, in addition to those who remained in Judah, there were significant Jewish communities in Babylon and in Egypt; this was the beginning of the later numerous Jewish communities living permanently outside Judah in the Jewish Diaspora. According to the book of Ezra, the Persian Cyrus the Great ended the exile in 538 BCE, the year after he captured Babylon. The exile ended with the return under Zerubbabel the Prince (so-called because he was a descendant of the royal line of David) and Joshua the Priest (a descendant of the line of the former High Priests of the Temple) and their construction of the Second Temple in the period 521–516 BCE. In the seventh year, in the month of Kislev, the king of Akkad mustered his troops, marched to the Hatti-land, and encamped against the City of Judah and on the ninth day of the month of Adar he seized the city and captured the king. He appointed there a king of his own choice and taking heavy tribute brought it back to Babylon. Jehoiachin's Rations Tablets, describing ration orders for a captive King of Judah, identified with King Jeconiah, have been discovered during excavations in Babylon, in the royal archives of Nebuchadnezzar. One of the tablets refers to food rations for "Ya’u-kīnu, king of the land of Yahudu" and five royal princes, his sons. The Cyrus Cylinder, an ancient tablet on which is written a declaration in the name of Cyrus referring to restoration of temples and repatriation of exiled peoples, has often been taken as corroboration of the authenticity of the biblical decrees attributed to Cyrus, but other scholars point out that the cylinder's text is specific to Babylon and Mesopotamia and makes no mention of Judah or Jerusalem. Professor Lester L. Grabbe asserted that the "alleged decree of Cyrus" regarding Judah, "cannot be considered authentic", but that there was a "general policy of allowing deportees to return and to re-establish cult sites". He also stated that archaeology suggests that the return was a "trickle" taking place over decades, rather than a single event. An exhibition in Jerusalem has on display over 100 cuneiform tablets that detail trade in fruits and other commodities, taxes, debts, and credits accumulated between Jews driven from, or convinced to move from Jerusalem by King Nebuchadnezzar around 600 BCE. They include details on one exiled Judean family over four generations, all with Hebrew names. The exilic period was a rich one for Hebrew literature. Biblical depictions of the exile include Book of Jeremiah 39–43 (which saw the exile as a lost opportunity); the final section of 2 Kings (which portrays it as the temporary end of history); 2 Chronicles (in which the exile is the "Sabbath of the land"); and the opening chapters of Ezra, which records its end. Other works from or about the exile include the stories in Daniel 1–6, Susanna, Bel and the Dragon, the "Story of the Three Youths" (1 Esdras 3:1–5:6), and the books of Tobit and Book of Judith. The Book of Lamentations arises from the Babylonian captivity. This period saw the last high-point of biblical prophecy in the person of Ezekiel, followed by the emergence of the central role of the Torah in Jewish life. According to many historical-critical scholars, the Torah was redacted during this time, and began to be regarded as the authoritative text for Jews. This period saw their transformation into an ethno-religious group who could survive without a central Temple. This process coincided with the emergence of scribes and sages as Jewish leaders (see Ezra). Prior to exile, the people of Israel had been organized according to tribe. Afterwards, they were organized by smaller family groups. Only the tribe of Levi continued in its temple role after the return. After this time, there were always sizable numbers of Jews living outside Eretz Israel; thus, it also marks the beginning of the "Jewish diaspora", unless this is considered to have begun with the Assyrian captivity of Israel. In Rabbinic literature, Babylon was one of a number of metaphors for the Jewish diaspora. Most frequently the term "Babylon" meant the diaspora prior to the destruction of the Second Temple. The post-destruction term for the Jewish Diaspora was "Rome", or "Edom". 609–598 BCE Reign of Jehoiakim (succeeded Jehoahaz, who replaced Josiah but reigned only 3 months) Began giving tribute to Nebuchadnezzar in 605 BCE. First deportation, purportedly including Daniel. 520–515 BCE Return by many Jews to Yehud under Zerubbabel and Joshua the High Priest. Avignon Papacy, sometimes called the "Babylonian Captivity of the Papacy"
^ Coogan, Michael (2009). A Brief Introduction to the Old Testament. Oxford: Oxford University Press. ^ Moore, Megan Bishop; Kelle, Brad E. (2011). Biblical History and Israel S Past: The Changing Study of the Bible and History. Wm. B. Eerdmans Publishing. pp. 357–58. ISBN 0802862608. Retrieved 11 June 2015. Overall, the difficulty in calculation arises because the biblical texts provide varying numbers for the different deportations. The HB/OT’s conflicting figures for the dates, number, and victims of the Babylonian deportations become even more of a problem for historical reconstruction because, other than the brief reference to the first capture of Jerusalem (597) in the Babylonian Chronicle, historians have only the biblical sources with which to work. ^ Dunn, James G.; Rogerston, John William (2003). Eerdmans Commentary on the Bible. Wm. B. Eerdmans Publishing. p. 545. ISBN 978-0-8028-3711-0. ^ Jonathan Stökl, Caroline Waerzegger (2015). Exile and Return: The Babylonian Context. Walter de Gruyter GmbH & Co. pp. 7–11, 30, 226. ^ Encyclopaedia Judaica. 3 (2nd ed.). p. 27. ^ Stern, Ephraim (November–December 2000). "The Babylonian Gap". Biblical Archaeology Review. 26 (6). From 604 BCE to 538 BCE—there is a complete gap in evidence suggesting occupation. ... I do not mean to imply that the country was uninhabited during the period between the Babylonian destruction and the Persian period. There were undoubtedly some settlements, but the population was very small. Many towns and villages were either completely or partly destroyed. The rest were barely functioning. International trade virtually ceased. Only two regions appear to have been spared this fate—the northern part of Judah (the region of Benjamin) and probably the land of Ammon, although the latter region awaits further investigation. ^ Philip J. King, Jeremiah: An Archaeological Companion (Westminster John Knox Press, 1993), p. 23. ^ malbim to ezekiel 24:1, abarbanel et al. ^ a b "Second Temple Period (538 BCE. to 70 CE) Persian Rule". Biu.ac.il. Retrieved 2014-03-15. ^ a b c d e f g Finkelstein, Israel; Silberman, Neil Asher (2001). The Bible Unearthed: Archaeology's New Vision of Ancient Israel and the Origin of Its Sacred Texts. Simon and Schuster. ISBN 978-0-684-86912-4. ^ Thomas, David Winton (1958). Documents from Old Testament Times (1961 ed.). Edinburgh and London: Thomas Nelson. p. 84. ^ Cf. 2Kings 24:12, 24:15–24:16, 25:27–25:30; 2Chronicles 36:9–36:10; Jeremiah 22:24–22:6, 29:2, 52:31–52:34; Ezekiel 17:12. ^ Translation from Aḥituv, Shmuel. Echoes from the Past. Jerusalem: CARTA Jerusalem, 2008, p. 70. ^ a b Grabbe, Lester L. (2004). A History of the Jews and Judaism in the Second Temple Period: Yehud – A History of the Persian Province of Judah v. 1. T & T Clark. p. 355. ISBN 978-0567089984. ^ "Ancient tablets on display in Jerusalem reveal Jewish life during Babylon exile". ^ "Ancient tablets reveal life of Jews in Nebuchadnezzar's Babylon". 3 February 2017 – via Reuters. ^ Blum, Erhard (1998). "Issues and Problems in the Contemporary Debate Regarding the Priestly Writings". In Sarah Shectman, Joel S. Baden. The strata of the priestly writings: contemporary debate and future directions. Theologischer Verlag. pp. 32–33. ^ Rainer Albertz, Israel in exile: the history and literature of the sixth century BCE, p.xxi. Wikimedia Commons has media related to Babylonian captivity. "Babylonian Captivity" . Encyclopædia Britannica (11th ed.). 1911. "Babylonish Captivity" . New International Encyclopedia. 1905.